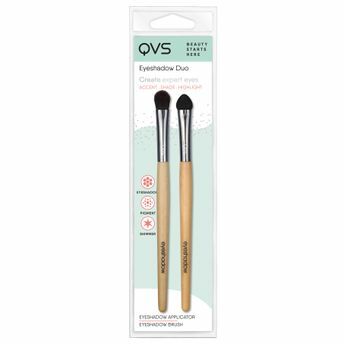 Create expert eyes, accent, shade and highlight with the QVS Eyeshadow Duo. The set contains two eyeshadow brushes. The first brush comes with bristle head that helps in easy colour application with subtle blending and highlighting. The second brush features a velvet soft sponge applicator applies eye make-up evenly and easily without streaks or creases. Both brushes are soft and gentle on the skinTip: Try pressing eyeshadow onto the eyelid instead of wiping. This will build up colour and coverage quicker.